We booked our site 3 weeks in advance with a deposit to secure our reservation. The night we were scheduled to stay at this campground, I called ahead & spoke to the owner to notify that we would be arriving late because we were at Mt. Rushmore's evening lighting. At the same time, the owner emailed us -- because "she couldn't reach us by phone"..... When we arrived we found an envelope with a map which was totally impossible to read. It was a hand drawn map of 7 (yes seven) RV sites, on a piece of paper with highlighting to direct us to the site. For 1 1/2 hours of driving around (in what looked like a junk yard,) we couldn't possibly find our site. There were no signs, no site numbers, only corners where we literally had to back up and maneuver to try to navigate around impossible dead ends. The note included a telephone number to contact the owner. Unfortunately, there was no phone service in the campground! (That's probably why she wasn't able to reach us!!!) The note indicated that the owner's home was the "Red Barn -- behind the corral", and that we could reach them if we needed help. Neither the Barn nor the Corral was marked and both were impossible to find. In desperation, at 1:00 am, we left to find another campground. When we called the next morning, to ask for a refund, the owner's response was: "We don't give refunds, so do what you have to do!" This IS NOT "Good Sam" quality. We've been camping for over 30 years and have NEVER seen anything like this campground. Guests should be able to find their site--in daylight or in the dark! Good Sam Raters should totally remove their "seal of approval" from this campground. We spent a week at The Crooked Creek RV Park and found it to be centrally located for access to all of the parks and monuments in the area. The resort is right off the highway but we didn't observe any excess noise. The park roads and sites are gravel and level. There are many trees (we were still able to use our satellite) and green space as well. The laundry and bathrooms were clean and functional. We will definitely stay here again. A little disappointed overall. We booked a pull thru site and recieved a very uneven back im site. They refused to give me the Good Sam discount. I was told that I got their best rate and the rates were going up the following day. We were only there for one night, so what happened the next day was no matter to me. The people were nice. The pool was cute. The sites, unless you are in the middle of the park are really unlevel. They are well located to get to mt rushmore. Would probably try a different place if we come through again. The sites were the SMALLEST (narrowest) sites we encountered on our 18 state trip this summer. We were unable to open our awning and the trailer in the next site did not have slideouts. When those campers left, the next campers had a triple slide toyhauler. They were unable to open their main slide fully until we left the next morning. The site next to us on the other side was occupied by an old motorhome that was sitting on concrete blocks with the awning tied down to our electric service pole and to a tree at the front of the site. It was obvious it had been there for longer than the camping season and the site was littered with wooden pallets (to avoid the mud) and some were being used as a "porch" under the awning. Ice at the service station down the road about half a mile was $1.79 a bag, The same 5 pound bag was $3.99 at the campground office. WIFI service was not available (advertised as upgraded service) and the tatterd sign "WIFI MAY NOT WORK" taped to the register gave the indication that it had been sitting there for much longer than "the next service call" to repair the WIFI. The office staff was apologetic and understanding when I voiced my concerns, but it was obvious they had heard the same conversation a number of times in the past. 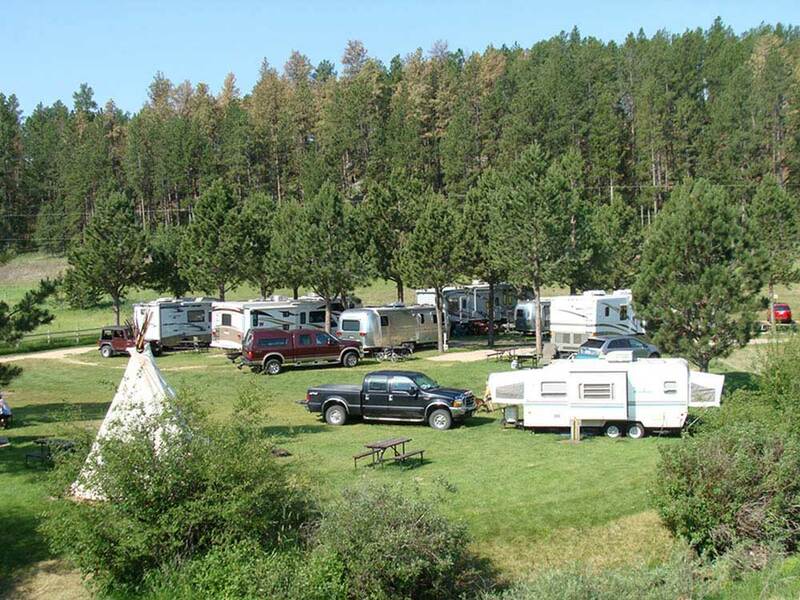 The campground location is "convenient" to the Black Hills tourist areas, but there are several campgrounds along the same highway that offer better sites and functional services at similar and often cheaper rates. I'd pass this one by in favor of campgrounds either closer to Rapid City or, if you want "rustic" closer to Hill City. There are some excellent "out of the way" and some "family oriented" campgrounds in the area, Cooper Creek just isn't one of them.